When François Bellenger saw the built-up bay of Famagusta, he wondered about the future development of this place that had been barricaded and under surveillance by the Turkish military since 1974. Refusing to become ensnared by the romanticism conjured up by these modern ruins, he took a stance against the wholesale (over-)development of the coast and fantasized about the demolition of the abandoned town. 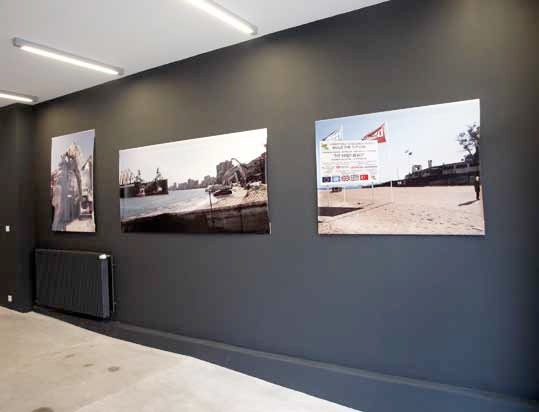 The large prints on tarpaulin, which are presented as a series of photographs of construction sites, fill the entrance area of the Maison de l’Architecture, as if they were documenting an architectural project in progress. In response to this space suspended by war, François Bellenger stages the recent tools of territorial war. 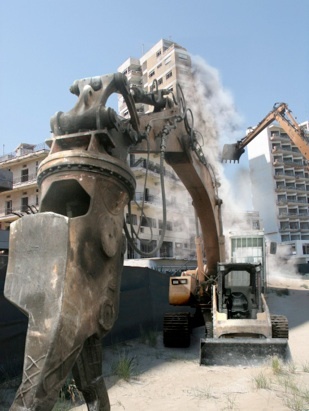 In the Near East conflicts, gigantic bulldozers arrive to destroy dwellings, in some cases whole apartment blocks, in order to broaden narrow streets and thus have control over certain zones where there are pockets of resistance. Or simply as a means of humiliation, and denial of the other’s existence. Thanks to vectorial imagery and photomontage, the bulldozers which François Bellenger shows are not there for strategic purposes, to win a military or symbolic war, but rather to completely erase an architectural model, and subvert the repressive power of the modern city, denying, not without irony, the geopolitical challenges and stakes of such a place, and the human side-effects of such destruction. On the fake panels which feature alongside these fantasized construction sites, we see that the works are being undertaken by the Bouygues company. 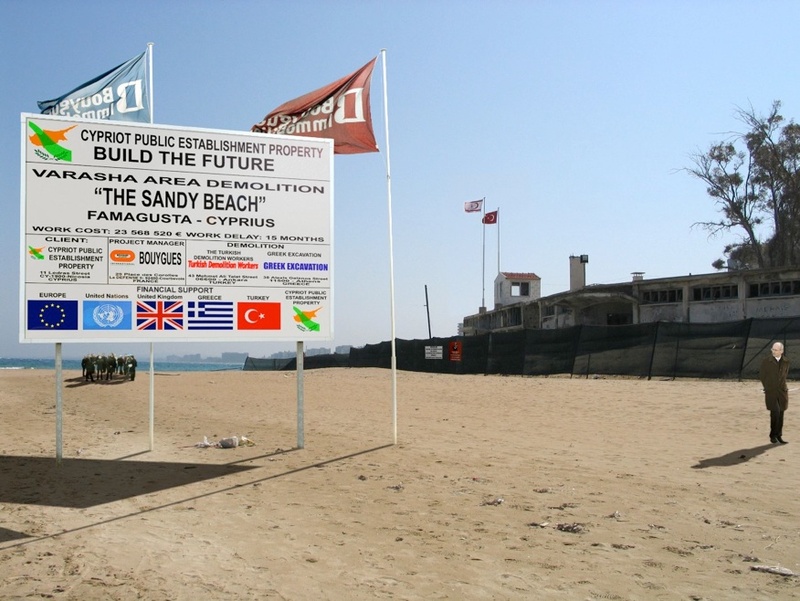 The flags marked on these hoardings indicate that the site is also being backed by Europe, the UK, the UN, and by Turkey and Greece—two countries finally brought together for one and the same project, which, however, does not involve destruction. These photographs, with their well nigh perfect digital definition, play on a cold, mineral aesthetics. Just one of the photos avoids the imitation of the representation of a realistic building site. The mechanical diggers are still there, but the image’s central feature, a hoarding displaying a view of the beach at Varosha, with absolutely no construction in evidence, does not respond to the customary practices. When a building is destroyed, the empty place is never depicted, but the architectural projects which will replace it are. Here, then, the project does indeed stop at the tabula rasa, like some ironical and absurd return to a paradise lost, with the deserted beach and nature restored to what they are.